Caught in the rat-race of today’s hustle-bustle, modern man has little time for poems, prayers and parables to bolster his views. This is where adages or proverbs come in handy for everyone. Whether it is the soldier standing guard on an inclement glacier, a CEO addressing a boardroom meeting, a lover loading his epistle with romantic overtones, a student debating on a podium, a preacher delivering a landmark sermon or a politician addressing a rally, they take recourse to pithy sayings to pack their messages with punch. How of ten has a timely and apt quote not uplifted a pathetic person, saved a relationship, nay, altered destinies and histories round the world! 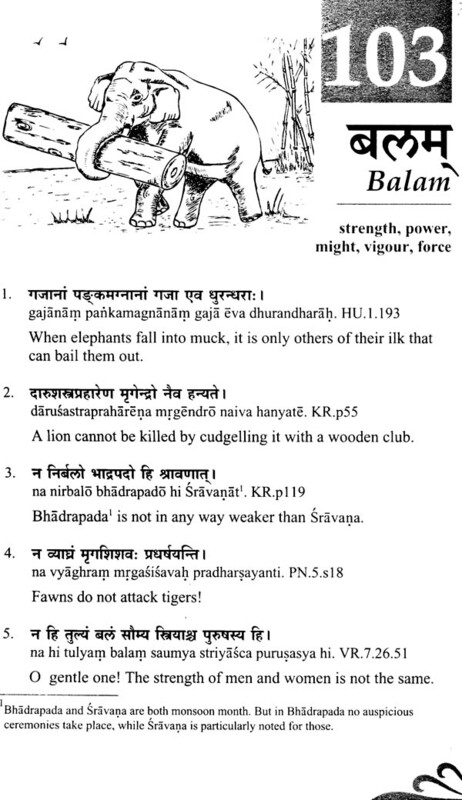 This book is an English translation of Sanskrit adages, culled from traditional sources and everyday wisdom. So, as you traverse through the rocks, rivers and rubble of life, may the adages console, counsel and comfort you. Quotes heal, seal and help people express what they feel. 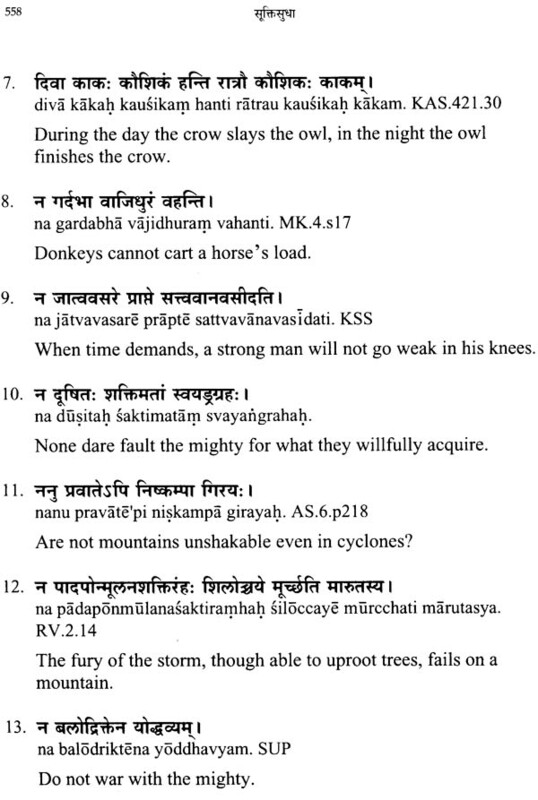 Sanskrit, being a hoary language, its literature is replete with sayings for every season and reason. 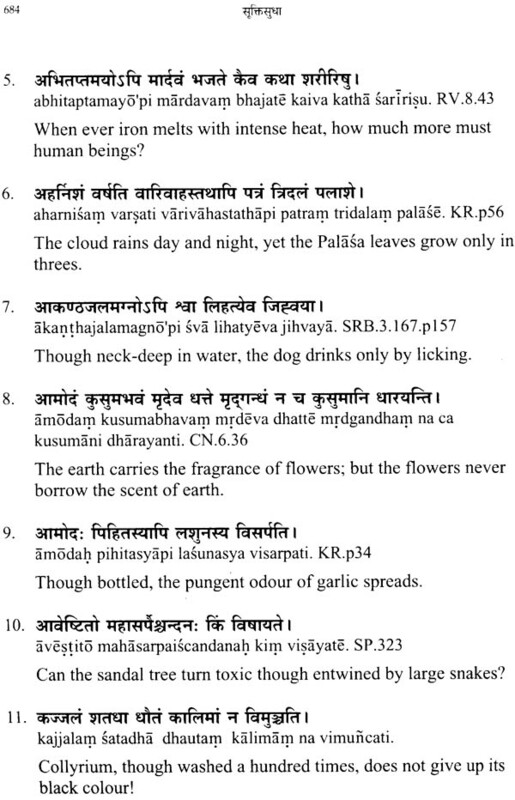 Sukti-sudha – The Elixir of Adages is a compilation of Sanskrit proverbs culled from Sanskrit literature and its folklore giving a mention of their sources as well as their translation. While genuine care has been taken to be faithful to the original expression, there have been times when we have given precedence to the spirit over the letter! 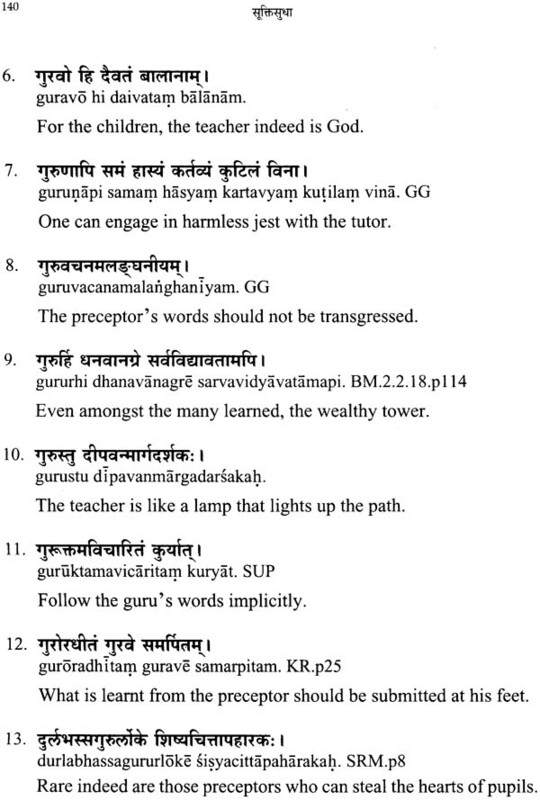 It is with immense humility and gratification that we offer Sukti-sudha unto Pujya Guruji Swami Tejomayanandaji, Head of the worldwide Chinmaya Mission, as his 60th Birthday Gift – an apt gift we thousand, since his usage of language is concise, precise and wise, indeed very much like these Suktis here. Philosophy is the result of the mutual interaction between man and universe and the former’s attempt to interpret the universal phenomena. Human thought has always been preoccupied with the values to be cherished in his existence on this planet and this is, broadly, the subject-matter of Vedic literature including the Upanisads — the culmination of ancient human reflection. The wisdom gained by the great seers by means of experience, observation and meditation gets reflected in their utterances which were later collected. 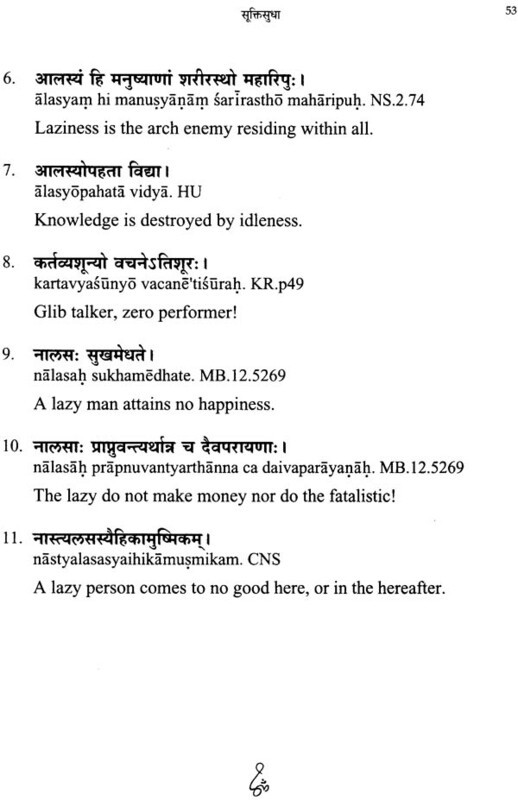 These wise reflections constitute the content of Subhasitas and Suktis (gnomes) in Sanskrit literature. Human existence on this planet is beset with the operation of the pair of opposites like joys and sorrows, smiles and tears, light and shade, descents and ascents and the like. Ancient seers meditated upon the amazing phenomenon called human life and tried to raise certain fundamental questions on existence and find out answers for them. It is in the Upanisads that we find human thought at its best, where the significant part of its philosophy is dealing with man’s quest for overcoming the duality of human existence, a continuous enquiry for the attainments of unmixed bliss undaunted by the limitations of mundane world. At the same time Indian thought does not discard the joys of material life. On the contrary, the seers thought of various means to make life more joyful. 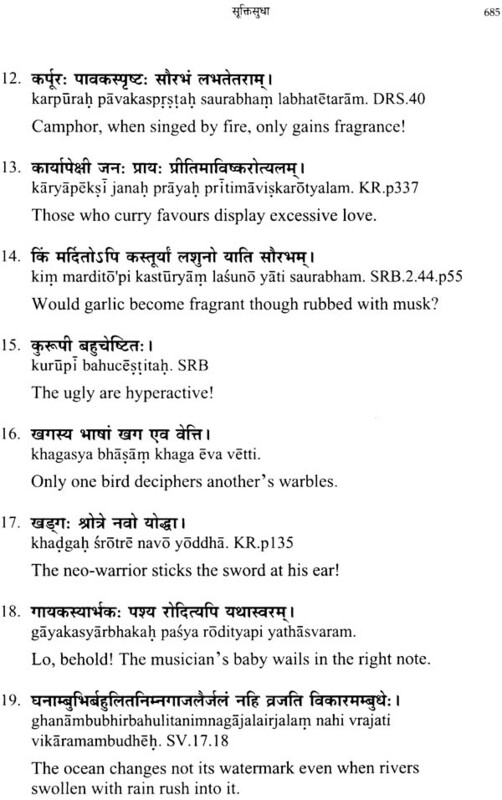 This aspect gets reflected In the richness of gnomic poetry in Sanskrit literature. Gnomic poetry means verses consisting of pithy sentences or witty sayings or observation on life or ethical teachings to the common man. In Sanskrit, gnomic poetry is represented in verses which are commonly known as Suktis, Saduktis, Subhasitas or Nitis. Such verses often reflect common man’s empiric knowledge recast by great men of supreme poetic capability and creativity. The Suktis are thus presented in an easy, unsophisticated and unassuming manner with the result they are easily intelligible to everybody. All systems of philosophy and arts have evolved to help man get rid of the threefold sorrows of life — adhibhautika, adhyatmika and adidaivika. All problems facing mankind and his environs have been the subject of their contemplative intellect. It is the sparks emanating from such thoughts, that we can see in Suktis like: asato ma sadgamaya—Take me from evil to good, tamaso ma Jyotirgamaya—take me from darkness to light, nirtyorma amrtam gamaya— take me from death to immortality. To implement this threefold advice in his day-to-day life is the challenge that man has been facing throughout his worldly sojourn. But then, there are very many instances wherein he has succeeded in implementing in his life and it is these that have been explained reasonably in the rich Sanskrit literature. The waters of the oceans can be contained in a shell. Time can be brought to palm of the hand. Deep ideas, sometimes incomprehensible to everybody, can be reduced to apt, effective, and beautiful Suktis. Conciseness and depth of meaning form the sine qua non of an aphorism. All great writers have the ability to condense great truths to just a few words and this art gives rise to Suktis. Any speaking language has proverbs. But only a literary language can have Suktis or gnomes. Gnome is the product of a single human mind where as proverbs are generated by tradition. The idea of Suktis is much more throbbing than Subhasitas. A gnome exhibits justice, devotion, and excellent advice also. These gnomes are the gems collected from the mine of Sanskrit literature. 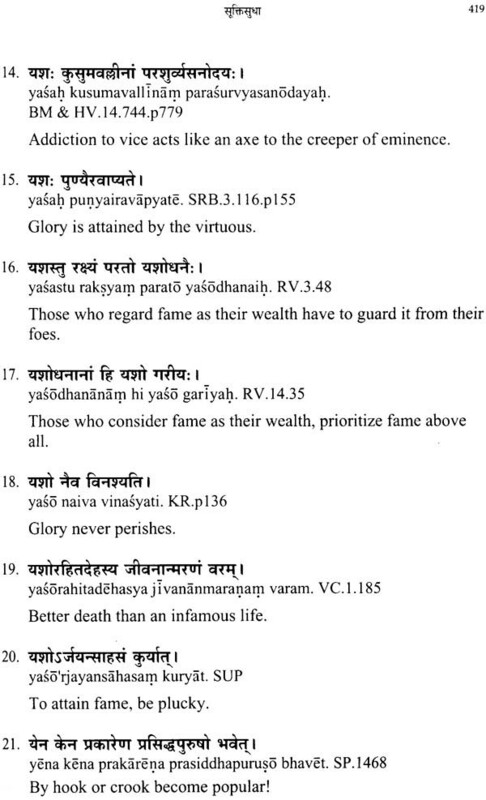 They are more direct than the Subhasita verses. They suddenly come to us like a bolt from the blue and introduce us to a vision hitherto unknown. They come, pervade, impress and fill our mind with the wave of joy of learning — something which is new and beneficial. Some of the Suktis will have, around them, a halo of sublimity in the novelty of the idea conveyed. I had put my utmost effort to trace out the source of the Suktis. Though I have succeeded in this effort to a great extent, the sources of some of the Suktis are beyond the ken of my knowledge and those scholarly friends who assisted me. With regard to those whose source remains unknown, the learned readers can help, so that more source material can be incorporated in the next edition. A little about what inspired me to take up this work: After my retirement from Maharaja’s College, Ernakulam, a sudden sense of void that descended on me was something I never experienced before. My thirty-three years of service as a teacher did not help me much to overcome the vacancy that threatened to engulf me. It was iii such a situation that I was awarded an assignment to edit and prepare an English translation of a collection of Suktis culled from various Sanskrit works. 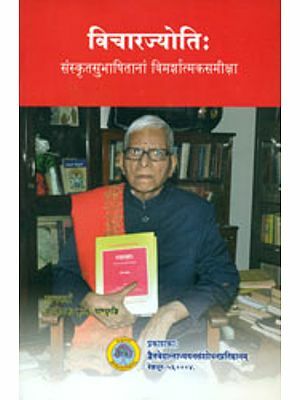 The collection has earlier been made by scholars like Dr. A. Ramaswami Iyengar and the late B.S. Ramkrishna Rao. When I went through the Suktis, I was doubtful of my capability to undertake the work. It was Dr. Ramankutty who persuaded me to take up the task and approach the same with patience and perseverance which I promptly did. When I read the wise sayings once again, I was struck by the wide variety of topics they dealt with. Indeed, I felt it as a vast world with sparks of human intelligence and wit. The elegance and directness betrayed by several maxims laid bare a peculiar world with sharp and intelligent peeps into human nature. This - feature of the Suktis attracted me and I struggled with the work of finding out the source of the Suktis, effecting categorization, as well as editing and translating them. There were times when I felt helpless by the sudden emergence of unexpected hurdles. In all those occasions when I was in need of help, the Trustees of the Chinmaya International Foundation had been a veritable source of energy and inspiration to me for which I am deeply indebted to them. Brni. Vividisha Chaitanya with her rare flourish of language, did a commendable work in assisting me with the correct translation of the Suktis. Several persons have been kind enough to help me in many ways in fulfilling the endeavour. I also express my deep sense of gratitude to Smt. E. Amminikutty (Adyar), Sri, P.Raviacchan (Tripunithura), Prof. C.G. Vijayanathan (Retd. Prof. of English, Maharajas College, Eranakulam). My profound thankfulness to the Lord for enabling me to successfully complete this wonderful work. 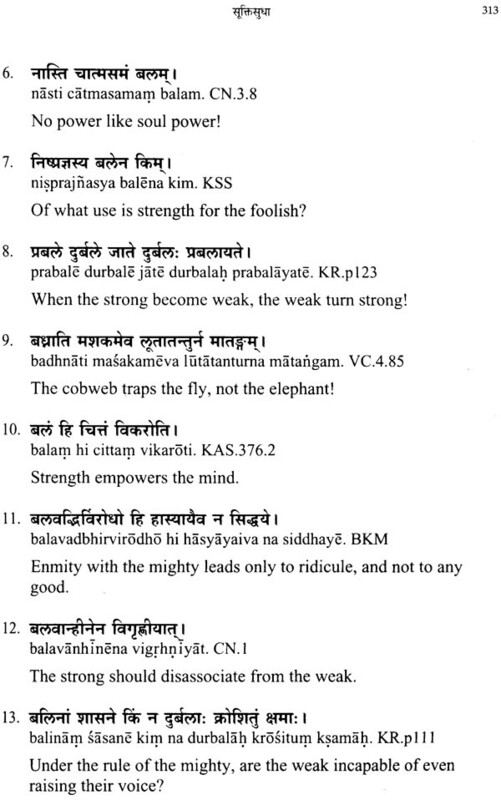 I am sure that this work of wise maxims couched in short pithy sentences in Sanskrit will be of use to all lovers of knowledge.